A surface layer of closely-packed, loosely cemented pebbles and cobblestones where the wind has swept away all smaller particles. 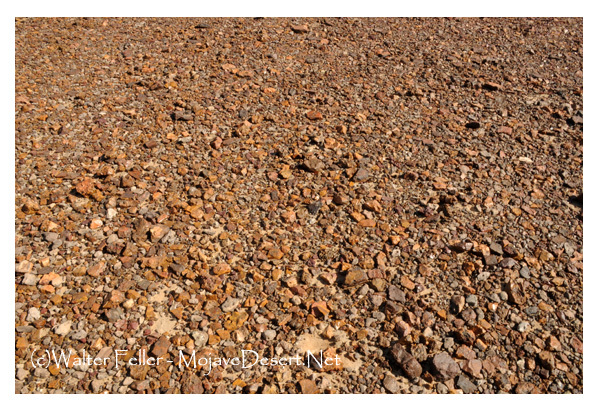 Deflation surfaces, also called deflation armor, desert pavement, deflation crusts, armoring, or several dozen other comparable terms can be recognized as a layer of rocks and pebbles covering the ground surface over finer sediments. These surfaces form through erosion processes, mainly wind weathering. Petroglyph photos, rock art in the Mojave Desert. ... Itaglios are usually made by removing rocks or otherwise incising the design into the desert pavement. Since the Precambrian Era, the Mojave Desert has experienced many .... the protective layer of desert pavement and promote erosion of fragile desert soils.